This 1960s bungalow was to be completely refurbished and modernised. Working with the developer and heating engineers, we came up with the optimum system, including the use of our SlimFix™ insulated panel's. The build was brought up to current regulations in terms of insulation levels by incorporating external wall insulation and new double glazing. As the developer wanted an efficient system, and height in the bungalow was at a premium, underfloor heating incorporated in the SlimFix® panel was the obvious choice. 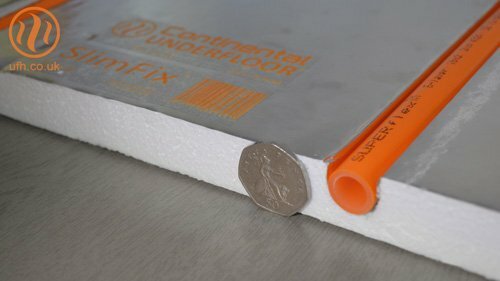 Designed in the UK, SlimFix® is a thin (25mm), single underfloor heating panel designed to make fitting underfloor heating easier and faster. The Technical Sales Adviser worked with the heating engineer to evaluate the best solutions for the new underfloor heating system. The engineer's preference was for SUPERflex™ pipe. Quite often, the solution is simple, and that's one of the major benefits of working with experts like Continental Underfloor - we know never to overcomplicate things. In this case, the SlimFix® method was the perfect solution, and would be compatible with the engineer's choice of SUPERflex™ (AluPlas® 16mm pipe also works well with this system). Another advantage of working with a specialist like us is that we can supply a full range of systems which will heat the property efficiently and fully. Underfloor heating isn't just for new builds. We will work with you on your refurbishment projects. New build or renovation, we have all the advice you need to get the job done on time, every time at Continental Underfloor. Using an expert supplier like us means you will get the benefit of 19 years' worth of practical knowledge, and your adviser will guide you throughout the project.